Sept 27, 2012 – Austin, Texas — LightArrow, Inc., today announces LifeTopix 5.0.4, an update to their popular personal productivity and organizer app. 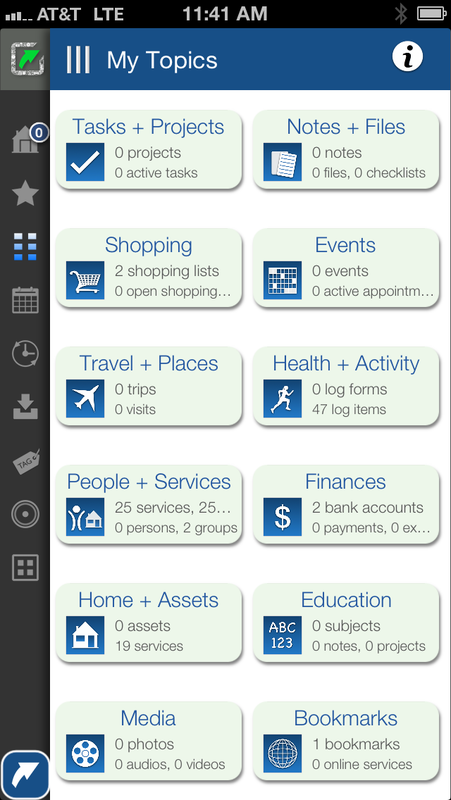 LifeTopix is a single app that allows users to manage topics, utilizing very powerful navigation and views. Version 5.0.4 is optimized for the new iPhone 5 and iOS 6, taking advantage of the iPhone 5’s larger four-inch screen and higher resolution. LightArrow is excited to announce the release of the latest version of LifeTopix – its flagship product – with optimization for the new iPhone 5’s larger screen. By filling out the iPhone 5’s 4-inch screen, users can better take advantage of LifeTopix’s 9-view dashboard, Quick Menu, 12 topic views, and detail views with side panel support. The detail views in LifeTopix are designed for height because of the richness of the app so the larger screen results in enhanced usability for iPhone 5 users. The LifeTopix app is optimized for use on iPhone 5 and the Retina Display iPad, but is compatible with iPhone 3GS, iPhone 4, iPhone 4S, second generation iPad, and the third and fourth generation iPod touch. The LifeTopix App requires iOS 5.0 or newer. LifeTopix 5.0.4 is available immediately from the Apple App Store as a free update for anyone with previous LifeTopix versions. For new users, LifeTopix 5.0.4 is available for a limited time at a special price of 99 cents. As a universal app, a single purchase enables the buyer to use this top productivity app on their iPhone, iPad, and iPod touch. Headquartered in Austin, Texas, LightArrow, Inc. was founded in 2009 by a team of visionaries who have dedicated their professional careers to the challenge of leveraging state-of-the-art information technology to solve problems that matter to people. Their mission is to build intelligent, world-class software products which dramatically improve our customers’ everyday lives. The company has extensive experience delivering quality solutions to some of the most sophisticated customers in the world and are very proud of our successful track record. Copyright (C) 2012 LightArrow, Inc. All Rights Reserved. Apple, the Apple logo, iPhone, iPod and iPad are registered trademarks of Apple Inc. in the U.S. and/or other countries. Other product and company names shown are trademarks of their respective owners.